I had a completely different blog planned for this week, but sometimes things do not go completely to plan, so this week we're returning to Hohneck, and some images that I wasn't able to add to the previous blogs. Apart from the extra piece at the very end which is something new, these were all taken on the same day as the recent entry Last Signs of Winter. I decided not to include them in the same post as they have a completely different feeling as the other images and didn't fit to the story that I wanted to tell, and as you know, it's all about the story. This one is about Hohneck. As you may already know if you have read other posts, Hohneck is an area in the Vosges region of France. It takes me about an 1.5 hours to get there from Basel and in summer this means that the alarm is set at 0300h so that I can get there around 0430h. It's a little easier in winter, but even with this, it is still one of my favourite locations. It's great for sunrise and sunset, wide open vistas, intimate landscapes, clouds and mist drifting around the peaks, on a clear day you can see Eiger, Mönch and Jungfrau as well as Mont Blanc, and of course there are the Chamois. I love this location for the versatility, I can combine my photography interests of wildlife and landscape. Sunrises and sunsets, wide open and intimate landscapes of the hills and valleys, and of course there is the wildlife. Or a combination, a Chamois looking down into a valley with the forest and lake in the background. There are draw backs though. This location is easy to get to, most of the wide open views can be seen within a few minutes from the car park, which means that there can be a lot of people. The best thing about getting to a location for sunrise or even before sunrise is that most people think that it's crazy to stand on the top of a hill at 0430h waiting for the pre-dawn light to start glowing on the horizon. This is a great time of the day, watching the light slowly change can be fascinating. It's easy to get lost in the light and forget that you're actually there to take photographs. 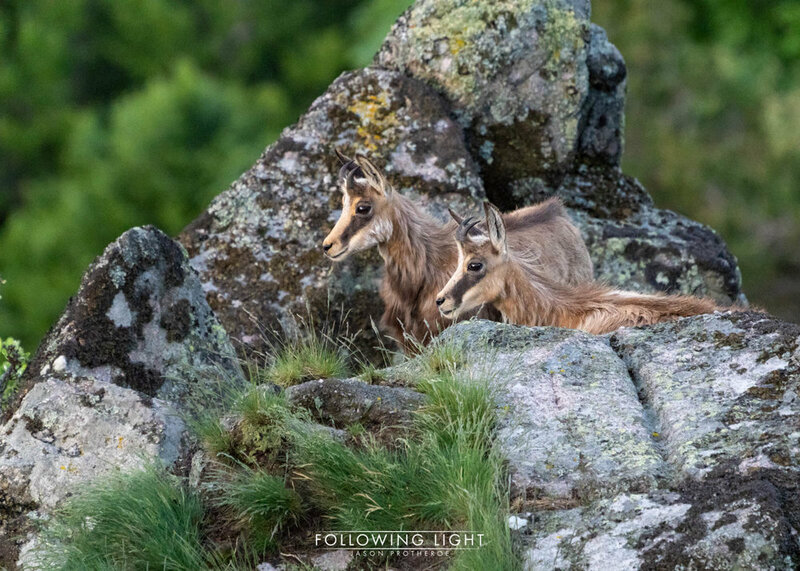 When I'm up there alone in the morning with only the Chamois around I sometimes get the feeling that they feel the same way and also spend some time watching the sunrise too. Not the young from this year, but still young enough to play. It's just that these kids play between the rocks that are on the edge of sheer drops! As an added extra this week, I have something that I will be doing more of. This footage was taken on the last trip to the Vosges. It's a short video, but for the first attempt I feel that it has come out quite good. There are some locations that you just really want to keep going back to.